Dare I say that the kids are going back to school soon? Did you just cheer with joy? Me too, me too! As much as I love when the kids are in school, I absolutely dread coming up with lunch ideas that are not only healthy but that my kids will actually eat. Apparently, according to a few teachers over the years, some of my food choices are not to the teacher’s idea of healthy. Lets just say that my oldest is one of the pickiest kids I have ever met in my life. She is getting better with age but for many years it didn’t matter what I put in her lunch she wouldn’t touch it. Lunches don’t have to be boring, they don’t have to be sandwiches all the time, and they don’t have to be elaborate Bento style lunches with perfectly cut out butterfly shaped fruit. They can be simple, quick and delicious. Today I am sharing a super easy, under 10 minutes to make – yup you can make this fresh before the kids head off to school, lunch recipe using Seeds of Change Spanish Style Wholegrain Rice with Quinoa, Red Bell Peppers and Corn that the kids will love! Seeds of Change® is a certified organic rice and ancient grain brand that you can heat up in the microwave or on the stovetop in just minutes. The quality of food we put in our bodies is important to us, but no matter how dedicated we are to finding organic foods, many of us are strapped for time. Seeds of Change offers the trust of an organic product, combined with the ease of simple-to-prepare instructions. 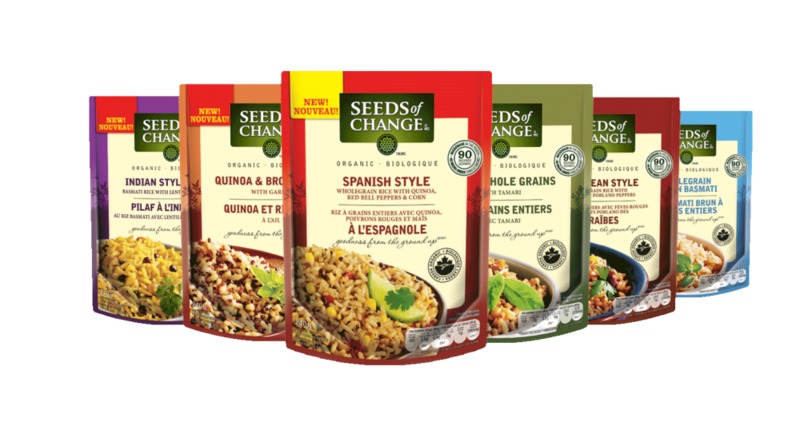 Seeds of Change is the only Certified Organic, ready-to-heat rice and grain brand available in Canada. Seeds of Change® contributes 1% of sales toward sustainable farming agriculture worldwide. In Canada, Seeds of Change worked with local partner Evergreen to identify 12 community gardens from coast to coast who need grant money to get their garden started and keep them going all season long. With one garden in every province, Seeds of Change is helping Canadians get access to local, organic food from coast to coast. The existence of a brand like Seeds of Change shows us that great tasting and easy to prepare food can be good for our bodies, and for the world. 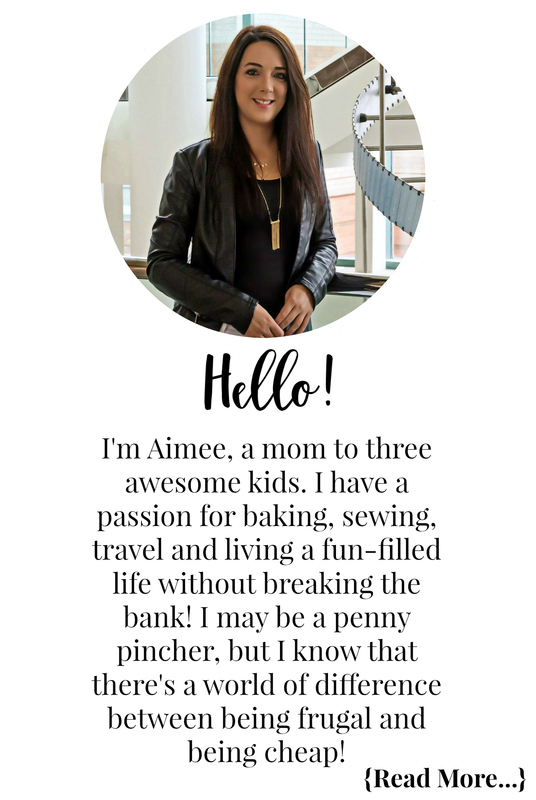 I absolutely love that this company gives back, it is something I am always looking for when choosing brands/products for my family. I also love that eating healthier and organic won’t break my bank or make me a slave to my kitchen thanks to Seeds of Change and their amazing line up of products. Slice your chicken breast into two thinner pieces, then slice into strips. If your strips are too long feel free to cut them in half. In a frying pan on med-high heat cook your chicken breast strips until they have a light golden brown colour starting to form on them. While your chicken is cooking pop your Seeds Of Change Spanish Style Rice in the microwave for 90 seconds following instructions on packaging. Turn your heat down to medium and add in 1-2 tbsp’s of Longo’s Hickory Smoke BBQ sauce. 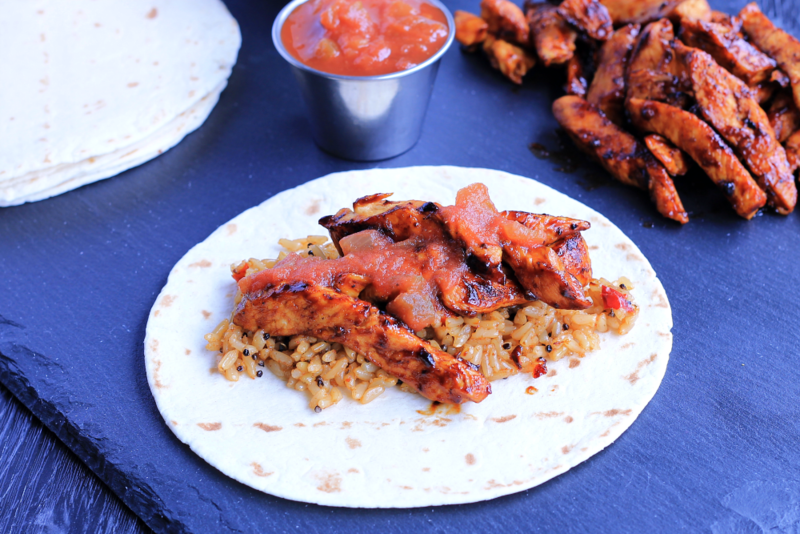 Continue to cook until the BBQ sauce starts to caramelize on the chicken. 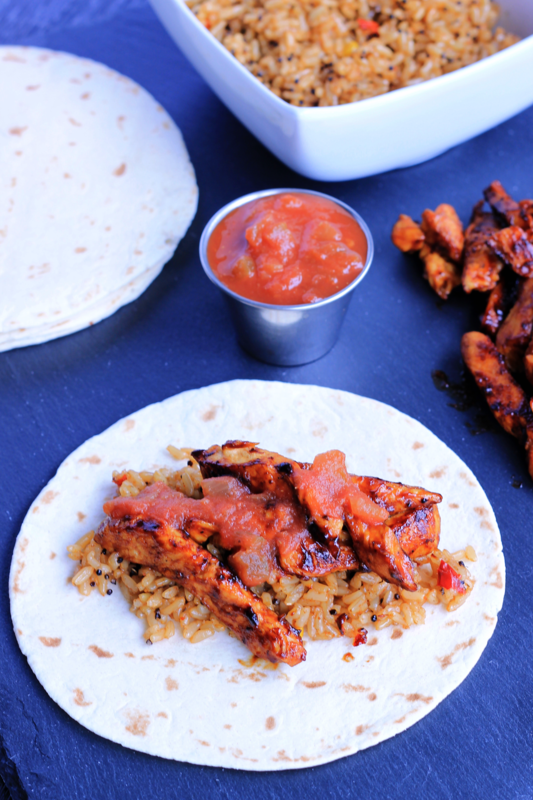 If making for a school lunch allow the chicken and rice to slightly cool before assembling the wrap. Send the salsa in a small container for your child to put on before they eat. Alternatively, you can send the items in containers and your child can assemble at lunch time. You can also add some greens to the wrap for a nice crunch! We have been incorporating Seeds of Change’s whole line into our lunch and dinner meals and I have to say the kids are loving every bite! I don’t think I have had to remind the kids to finish their meal once when Seeds of Change was on the table. It is so easy and versatile, it is a great addition to any meal or recipe. So next time you are out shopping keep your eyes peeled for Seeds of Change on your grocers shelf. 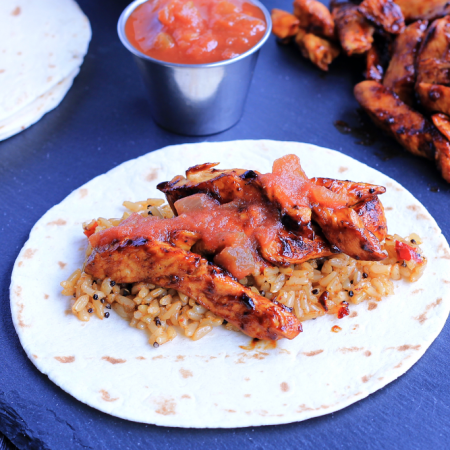 My absolute faves are the Spanish Style and the Quinoa Brown Rice with Garlic – YUM! For more product information visit the Seeds of Change® Canada website. Which Seeds of Change product are you excited to try first? Let me know in the comment section below! Disclosure: Although this post has been sponsored by Seeds of Change Canada, the opinions and language are all my own, and in no way do they reflect Seeds of Change Canada. Any product claim, statistic, quote or other representation about a product or service should be verified with the manufacturer, company, provider or party in question. This looks like a tasty dish,thanks for the recipe !